"Crispy, rich red potatoes roasted with onion and bacon. These are really yummy, and great with steak...don't skimp on the butter." Preheat oven to 400 degrees F (200 degrees C). Grease a 9x13 inch casserole dish. Place potatoes in an even layer in greased dish. Sprinkle onion and bacon over potatoes, then dot with butter. Cover dish with foil. Bake in preheated oven for 45 minutes. Remove foil and stir potatoes. Turn oven to broiler setting and allow potatoes to brown for approximately 5 minutes, until crispy. You may need to stir every minute or so to achieve even browning. Serve immediately. 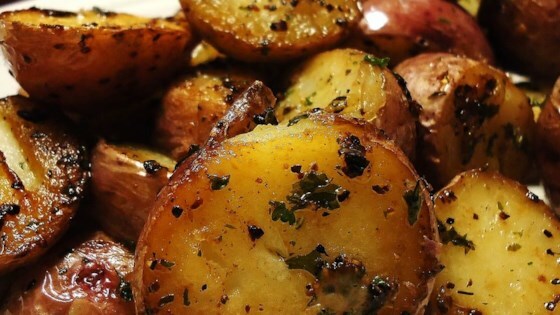 See how to make cheesy, crispy, delicious roasted red potatoes. Absolutely delicious. Definitely not for those watching their fat or cholesterol. I added extra bacon and used red onion, and the house smelled wonderful for hours. No need to use butter, there is enough fat in the bacon(Just plain YUMMY!). While the over all taste is accomplished we are not thinking heart smart. Excellent! I was skeptical adding raw bacon, but it was delicious! Definitely a 'keeper'! SO tasty & a great alternative to pan fried potatoes (not so healthy) Great recipe!